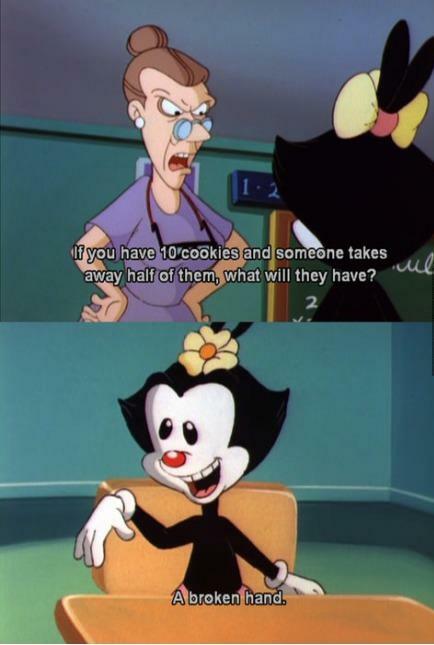 You guys remember Animaniacs? Of course you do! You're awesome, that's why! I remember watching this everyday after school and it was one funny cartoon. I recently found out that they are showing reruns on cable TV. Boomerang? Nick Toons? The Hub? I don't know which one but they are there! Anyways, I saw this funny comic from Dot and I just had to share. Later! Strangely I don't remember watching that one. I remember most pokemon and xmen. What other cartoons played during the afternoon at that time? Pinky and the Brain debuted on Animaniacs! Then, after awhile, I think they had their own show.